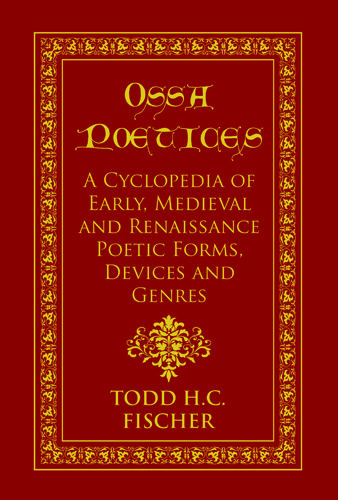 Ossa poetices: A Cyclopedia of Early, Medieval and Renaissance Poetic Forms, Devices and Genres. From the works of the troubadours and trouvères of the 14th-century to those of the skalds and scops of the 6th, poetry has been written in Europe for a very long time. 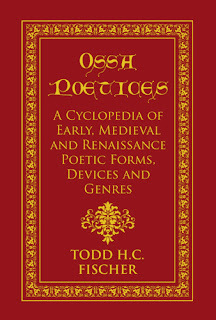 Within this volume Todd H. C. Fischer has gathered information on different poetic genres, forms and devices used across Europe during the early, medieval and Renaissance time periods. You may have heard of roundelays, madrigals, ballads, and—of course—sonnets in high school English class, but have you heard of hrynhent, leich, letrilla and zéjel? Mr. Fischer (who holds a double honours BA in English and Creative Writing) has made the study of medieval poetry a passion. He has scoured hundreds of volumes on medieval literature to here gather together information ranging from Anglo-Saxon versification to the obscure fatras of France. Most entries are illustrated by period examples, quoting works by Dante, Shakespeare, Marie de France, Raimbaut of Orange, and many others. Indices at the end of the volume allow easy cross referencing of entries by location and time period. Students of literature, lovers of poetry, and medieval re-creationists alike will find this volume essential.